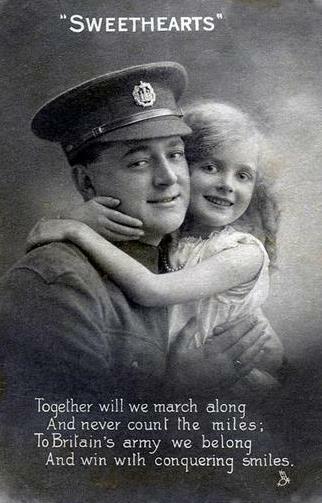 Beneath the title ‘“SWEETHEARTS”’, a girl and a British soldier (presumably her father; his cap badge is that of the Essex Regiment) are depicted embracing on the front of this postcard. There is a postmark, stamped Bulford Camp, Salisbury [in Wiltshire], at 1.30pm on 2 September 1916. ‘My Old Peach / What do you think of this card. I’ll be coming home to see you next week, and when I’m home, you’ll have to stop home from school. Love from Daddy x x x x x x’. ← Charles Wellens: From Belgium to Chippenham.